Back-to-back ipsy! Woo! For a look back at February --it was an eventful Glam Bag month-- and to learn a little more about the ipsy subscription, check out my last post. 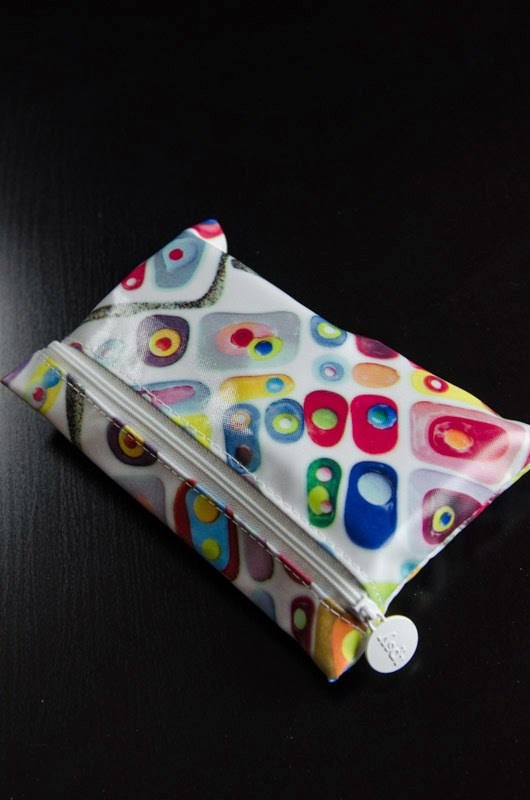 The print on this month's makeup bag was designed by San Francisco artist Klari Reis, and taken from her geography-based series "Street Anatomy." Her shapes do sort of look like birds'-eye-view globule-lined streets, right? I love that ipsy collaborated with an up-and-coming artist, and hope to see this turn into a series of collabs. Makes the Glam Bag that much more special. 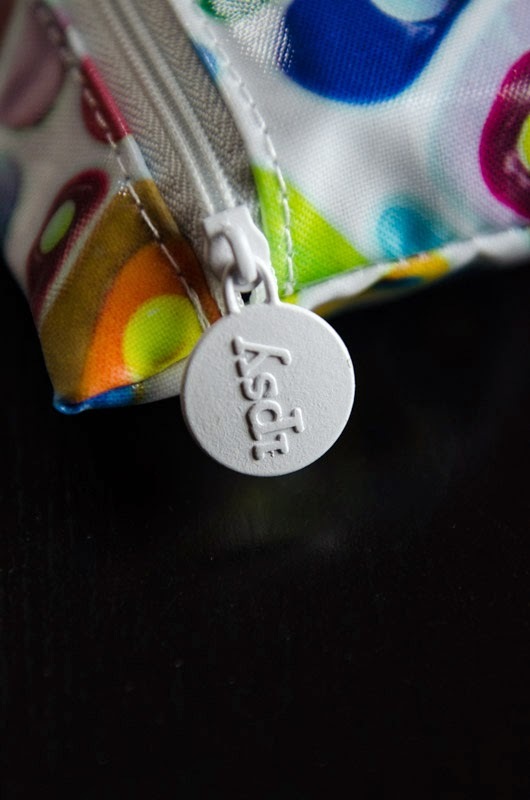 Love the Glam Bag zipper pulls. This month's theme was "Destination Beauty," and the items in the bag were, I suppose, curated loosely around the idea of destination travel, although only the bag itself, which featured an abstract San Francisco grid, and an eyeshadow quad named "Bora Bora" really, explicitly fit the concept. Nicole by OPI Roughles polish in On What Grounds? I couldn't find a price for this bottle, but I don't think this new line of polishes has been released yet, so that probably explains why. Similar OPI polishes are $8.99, so we'll go with that. BareMinerals Marvelous Moxie Lipstick in Get Ready. $18 full size, guessing the sample should be about $9. There were only four items in the Glam Bag this month instead of the usual five. Maybe the art print makeup bag stood in for the fifth? I wasn't really bothered by the omission, because the polish and the quad were worth the entire bag for me. Yes, even though the primer and lipstick sample felt like afterthoughts. Did you guys get these and think so too? I'm not sure exactly how a tube of primer and a relatively ho-hum deluxe lipstick sample are supposed to call up images of exotic destinations, but oh well. Again, there's the out-of-left-field OPI polish and the pretty quad, and the fact that this subscription is only $10 a month, so I'm happy enough. Here's the star of the moment. True, rather than screaming "vacation!" this guy squeals "Easter!" to me, but either way it's so quirky and cool. From the bottle design to the formula, this polish is entirely outside-the-box. The slanted glass looks like it's about to melt off and turn into a Miyazaki character, and the robin's-egg blue polish is flecked with tiny blue and purple beads that look like sand. I am so not a blue polish kind of girl, but this one is awesome: a coat goes on matte and has the texture of a candy-coated Easter egg. Love. 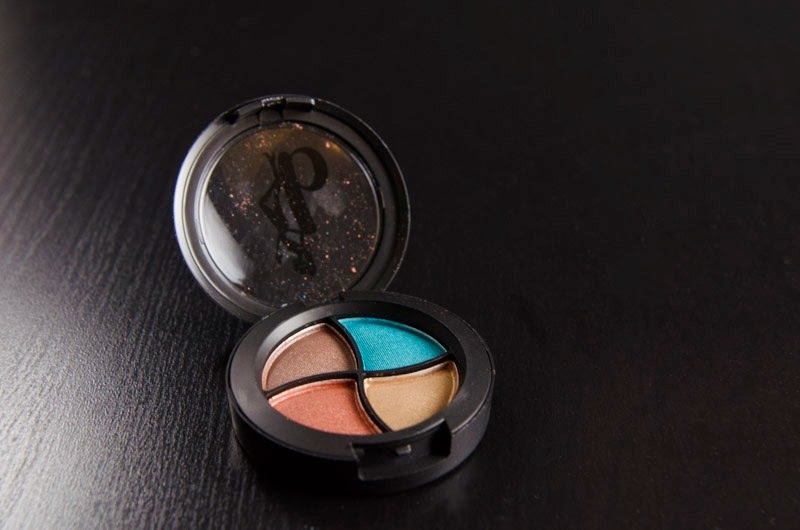 The shades on this aptly-named Bora Bora quad are gorgeous and really complementary. This isn't the most pigmented shadow, and I probably won't get much, if any, use out of the red and blue colors, but it's just so pretty and fits the month's theme perfectly. I wouldn't buy this for myself, but I loved getting it in my Glam Bag, if that makes sense. The grand total for this bag is about $42.99, and that's without taking the Klari Reis pouch into account, so that's a fantastic value. ipsy may not have thought through the month's theme entirely, and a couple of the products were meh, but I was happy overall. This is only my second month as an ipsy subscriber, and so far I've been sincerely pleasantly surprised. How did you like your March Glam Bag? 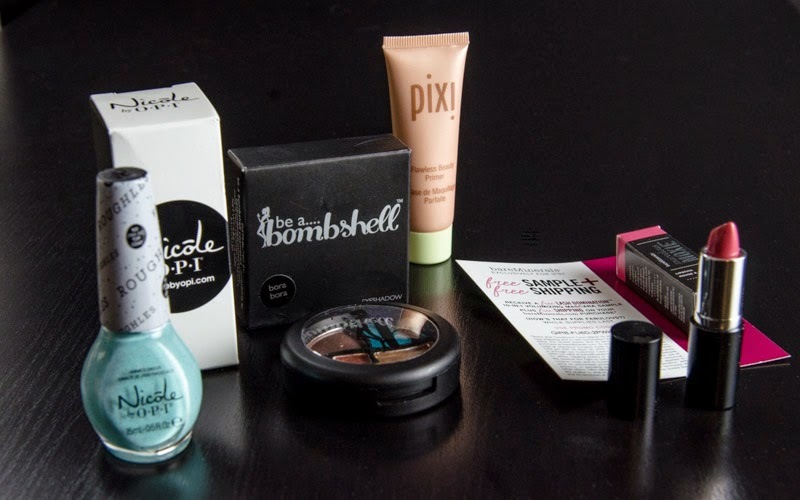 If you're not yet an ipsy member, feel free to click on this referral link (thank you!) 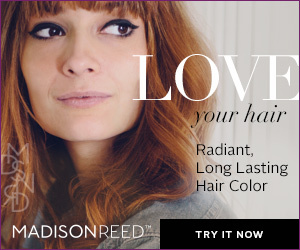 to learn more, complete your beauty profile, and sign up for your own sub. I actually really liked the primer and lipstick! But I agree, I don't see how they fit in with the theme. That eyeshadow quad looks really great - wish I had received that instead of the NYX trio! You know, I finally tried the primer last night and liked it, too (though I'm still stuck on the Dr Brandt Pores No More I got in my last Birchbox). Maybe I was a little underwhelmed because I've been receiving lots of primer in subs lately -- although I shouldn't complain, you really can't have enough primer in your life. It looks like the colors are pretty complimentary. I mean even if the lipstick is pretty meh, it kinda goes with the shades in the eyeshadow quad. I bet you could pull off a killer look with this, even if you're not on vacation. You're right, the lipstick is a perfectly competent little guy, and he does sport a nice shade of reddish. I think he and the primer were just outshined by the polish and quad. I honestly liked --and what's better, will use-- everything in the bag, though. I totally thought Easter when I saw the polish too--I got the same bag.